Most of the native habitat in California‘s San Joaquin Desert has been converted to row crops and orchards, leaving 35 threatened or endangered species confined to isolated patches of habitat. A significant portion of that farmland, however, is likely to be retired in the coming decades due to groundwater overdraft, soil salinity, and climate change. A new study led by researchers at UC Santa Cruz looked at the conservation potential of marginal farmland in the San Joaquin Desert and found that restoration of fallow farmland could play a crucial role in habitat protection and restoration strategies for the blunt-nosed leopard lizard and other endangered species. The study, published January 15. 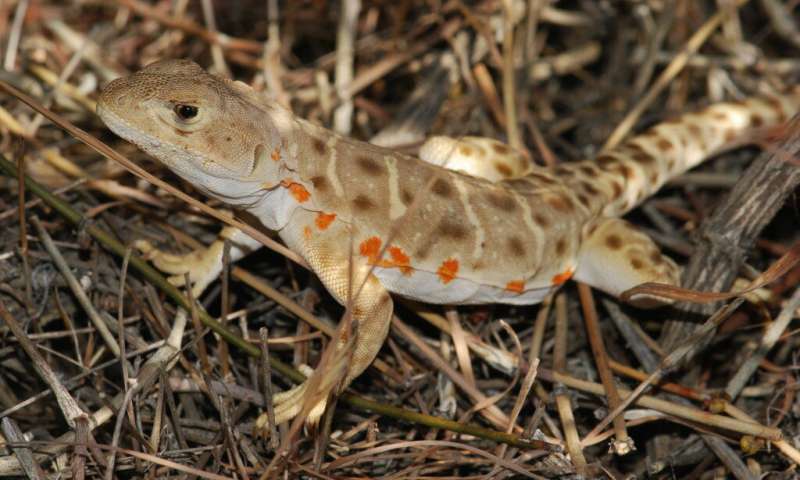 2019 in PLOS ONE, focused on the endangered blunt-nosed leopard lizard as an “umbrella species” whose habitat needs overlap with other threatened and endangered species in the San Joaquin Desert. The researchers identified more than 600 square kilometers of farmland with strong potential for habitat restoration. “These lands were continuously fallowed for three years of the recent California megadrought, which is a good indicator that they are likely to be retired from agricultural use over the coming decades. With proper planning and a strategic fallowing program, land managers have a good opportunity to restore lands in a way that optimizes habitat for endangered species,” said first author Joseph Stewart, who conducted the study as part of his Ph.D. thesis research at UC Santa Cruz. The study included a quantitative assessment of habitat loss and fragmentation, climate change impacts, habitat protection, and reintroduction opportunities for the blunt-nosed leopard lizard. Former desert turned into farmsby irrigation from far-away sources (e.g. – Colorado River) in California’s San Joaquin Valley and Central Valley. Photo by Amadscientist via Wikipedia. 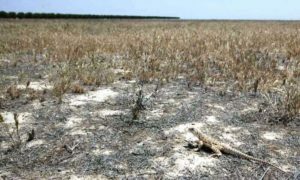 The researchers found that there has been ongoing loss of leopard lizard habitat, despite its listing as an endangered species. In fact, the total amount of habitat lost since it was first listed is greater than the amount of habitat currently protected through public ownership and conservation easements. In the midst of this downward trend in intact habitat, the emerging trend toward retirement of marginal farmland presents an opportunity to reclaim land for habitat restoration, Stewart said. For many of the region’s endangered species, including the blunt-nosed leopard lizard, sandy and alkaline soils that are least productive for agriculture appear to be ideal for conservation purposes, in part because they support less growth of exotic grasses and other invasive plants. One of the study’s findings was that invasive plants had caused the range of the blunt-nosed leopard lizard to contract along the wetter margins of its historical range. The San Joaquin Desert encompasses the western and southern two-thirds of the San Joaquin Valley, as well as the adjacent Carrizo Plain and Cuyama Valley. According to Stewart, retirement of farmland in the San Joaquin Desert has been projected to reach more than 2,000 square kilometers over the next three decades. The factors driving this include the build-up of salts in irrigated desert soils, reduced water availability and increased evaporation due to climate change, and the need to bring an area of historical groundwater overdraft into compliance with California’s Sustainable Groundwater Management Act. Stewart noted that both the U.S. Fish and Wildlife Service and the California Department of Fish and Wildlife have funds available to acquire habitat for endangered species. In addition, he said, the Nature Conservancy is interested in the opportunities for habitat restoration in this region. “Conservation of intact habitat is always preferable, but if that can be done in tandem with restoration of lands that are no longer viable for agriculture, the potential is there to set aside some large areas and hopefully delist some of these endangered species,” Stewart said. Featured photo (by Elliot Schoenig) shows a blunt-nosed leopard lizard. See UC Santa Cruz website.